We are fortunate in this area to be blessed with not only the Blue Ridge Parkway, and gorgeous mountains, but the North Carolina Arboretum just next to the parkway. It is less than a half hour away, so DH and I drove over to it over the weekend to see a most unusual exhibit. I took over 150 pictures while we were there, but I promise I won’t show you all of them today, LOL!! Some will have to wait for more posts later. I wanted to show you all this first, the Lego Sculptures by artist Sean Kenney. If you live in the area, make time to see this extraordinary work. 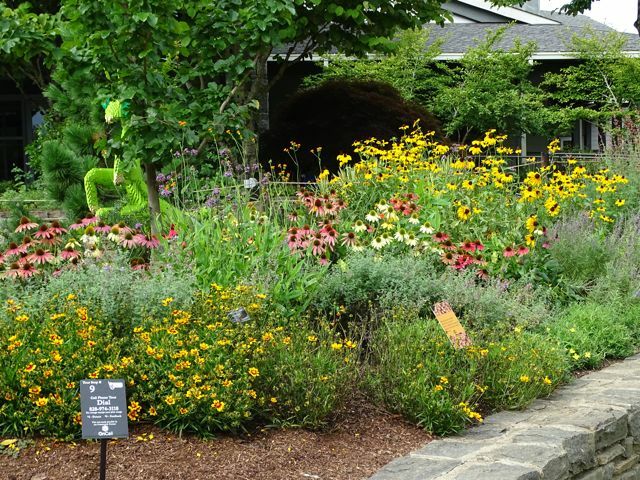 The NC Arboretum is one of several exhibit sites, with more all over the country. There are over 100 sculptures in Sean Kenney’s series Nature Connects, and we are lucky to have 14 of them here for a limited time exhibit. Although all of the sculptures are impressive, this Monarch on Milkweed was really a striking in its detail and colors. 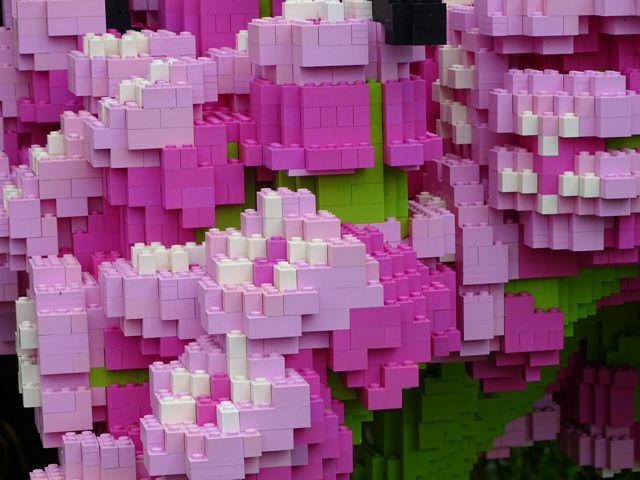 Up close, the legos look like a jumble of colors. Smaller and larger pieces, with dark and light shades create the illusion. Then, step back and the eye blends the colors into an extraordinary sight. 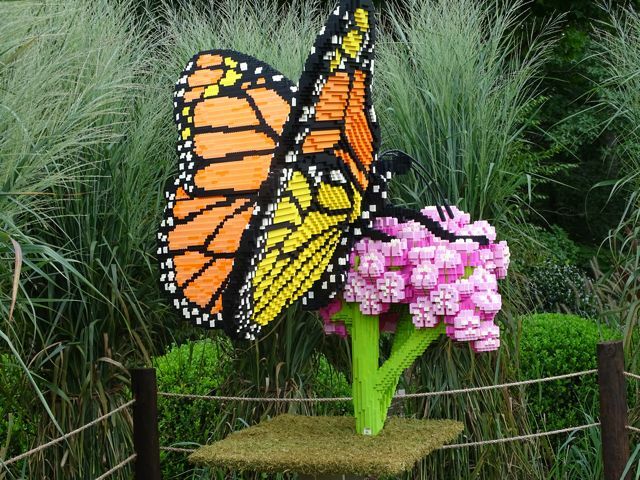 This Monarch on Milkweed sculpture contains 60,549 legos, the largest number of all the exhibits. It is four feet wide and over four feet tall. I think I took the most photos of this one too, I was so enchanted by the design and the intricacies of the work. I cannot imagine what it took to make this. 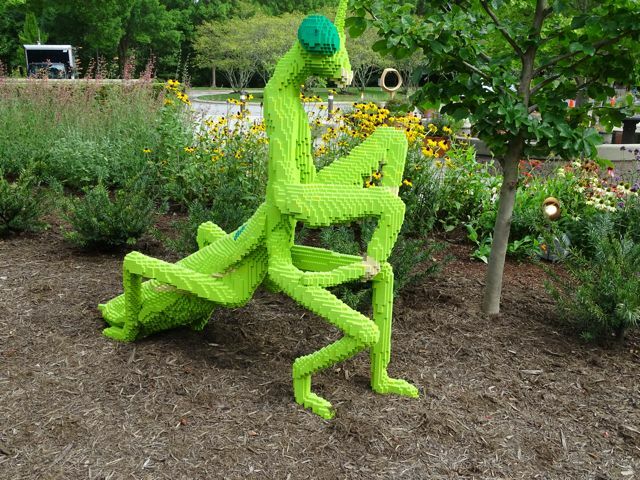 Sean Kenney did an interview with the NC Arboretum to discuss his work, and this piece which is a favorite. He spent over 160 hours just in design! See the interview HERE. Right in front of the Baker center is a Hummingbird with a Bellflower. Dramatic in its appearance, the hummingbird is suspended in air over the flower. Fascinating to just admire, and it is huge, over 6 feet high. I didn’t make a note as to how many legos are in this one, but it has to be well over 50,000. 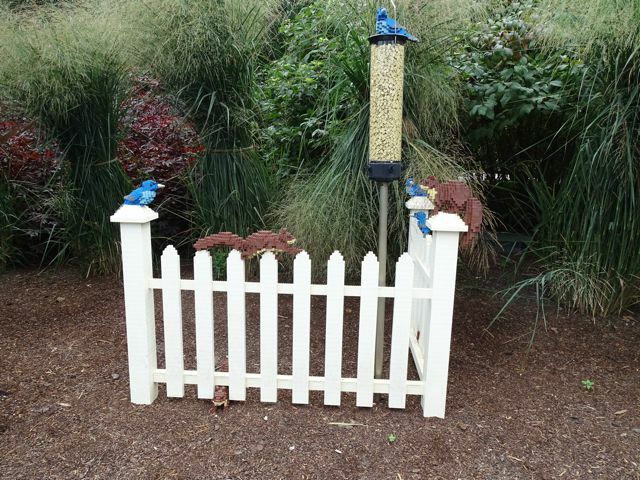 This one has a bit of whimsy, depicting the battle between squirrels and birds for the seeds in the feeders. Again the detail close up is extraordinary, all done with legos! The Pileated Woodpecker was high in a tree, just like you see them in nature. It had 4,424 legos. 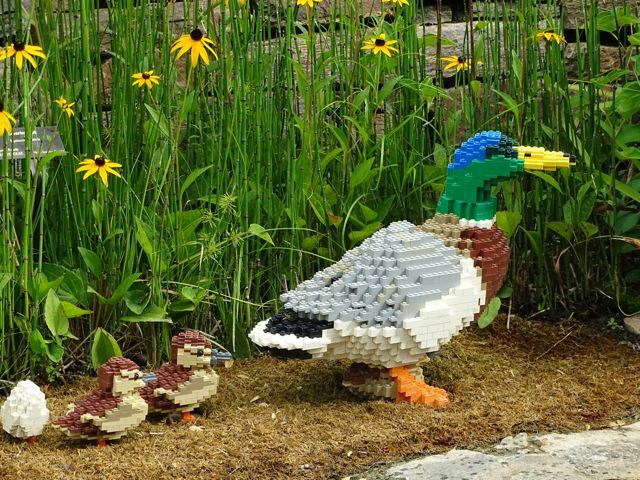 Near a pond, the Duck and Ducklings sculpture had 6,927 legos. 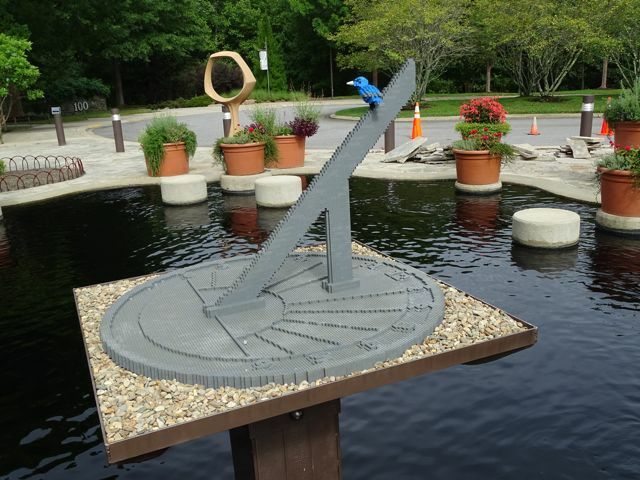 The Sundial was huge too, with 27,869 legos and had a little bluebird sitting near the top. The placement of the sculptures was part of the artistry. The Bald Eagle was placed high overhead, to emphasize the majesty of the bird. It was a grey morning, but you can see mountains in the distant background of the picture partially obscured with low rain clouds. 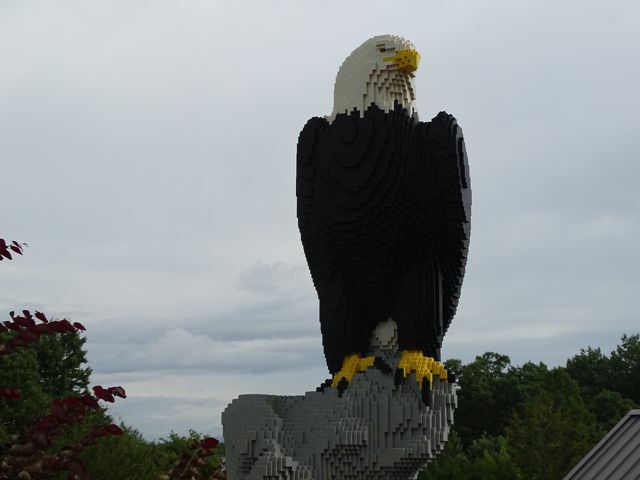 The eagle and its tree perch contained 42,198 legos, and was 59 inches tall. The Giant Praying Mantis was one of my favorites, peeking out over the top of the wildflower garden, it was a whimsical surprise. Circling around the garden to see it, the size is impressive standing five feet tall! Again, the detail of the legs and tail are so amazing! These were just so much fun to see these, wonderful from every angle. There were 52,164 legos in this piece. 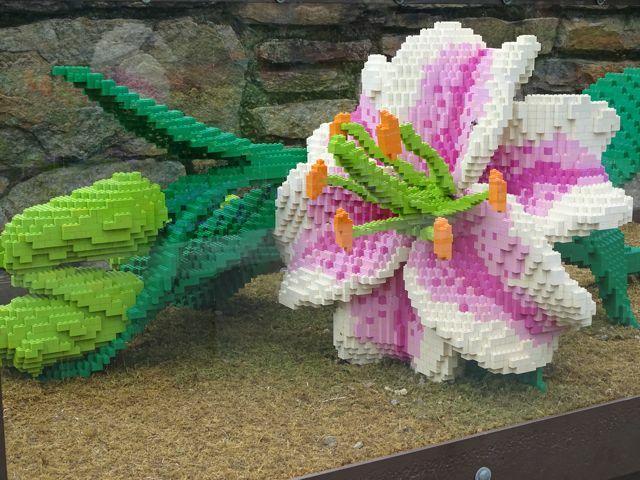 Then near the quilt garden was the Giant White Lily containing 32,514 legos. It was three feet tall, and 84 inches long from leaf end to the stem end. Incredible, they really need to be seen in person. If you live within driving distance of the North Carolina Arboretum, plan a day to see this extraordinary exhibit. I only showed you half of the sculptures, there are more to see. It will be here until October 23rd. I would even think of running down to South Carolina to see their exhibit as it would have different ones. More are on loan to gardens in Iowa, Indiana and Virginia. What do you think of this exhibit? Neat Neat Neat! I always have trouble with legos staying together, I bet these are glued and true works of art. Lovely post! Talk about creativity! 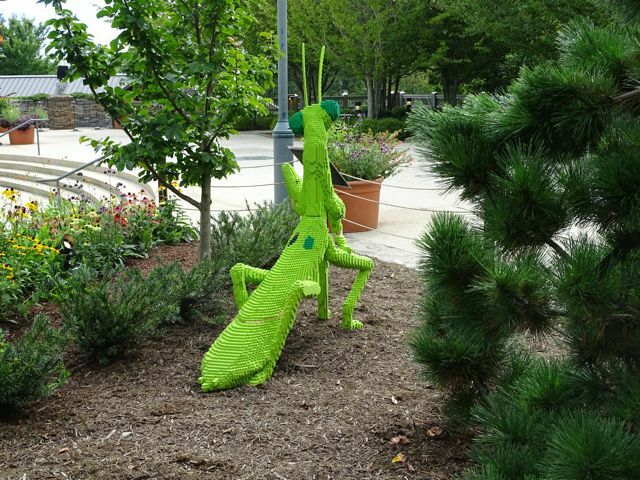 I am fond of monarchs, so I liked that sculpture, but the praying mantis gave me a chuckle. Thank you so very much for sharing! 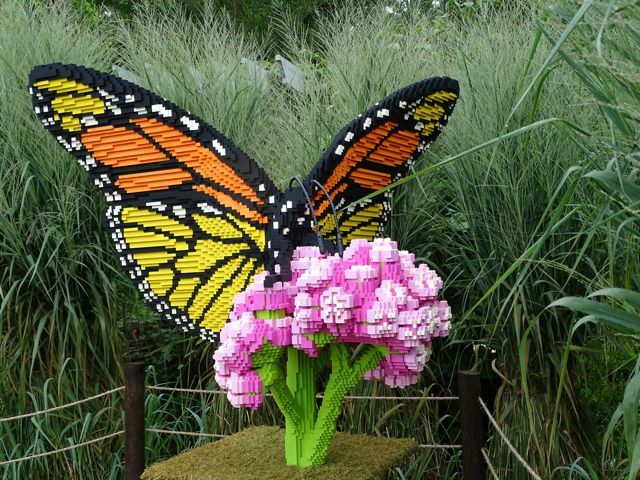 I cannot imagine the creativity to make such life-like sculpture out of Legos! Each one was beautiful. The Lego sculptures are so incredible. It is amazing what can be created from simple blocks. I so enjoyed seeing your pictures of them. Thank you. The monarch was my favourite also. Wish I could see them in person. Awesome! Any idea WHERE in Indiana another display is? We live near Indianapolis but I haven’t seen any PR about lego sculptures. Can’t make it to lovely NC or SC in the near future so sure would love to see one close by! Click on the links I provided for schedule and locations. Never mind – thought to look up his name & discovered it is at the INdianapolis Zoo only ’til Sept. 5! Hope we can squeeze it in! Aren’t they great! Went with my grandchildren to LegoLand in Florida-so impressive. Love the praying mantis! Beautiful photos you got; wow. 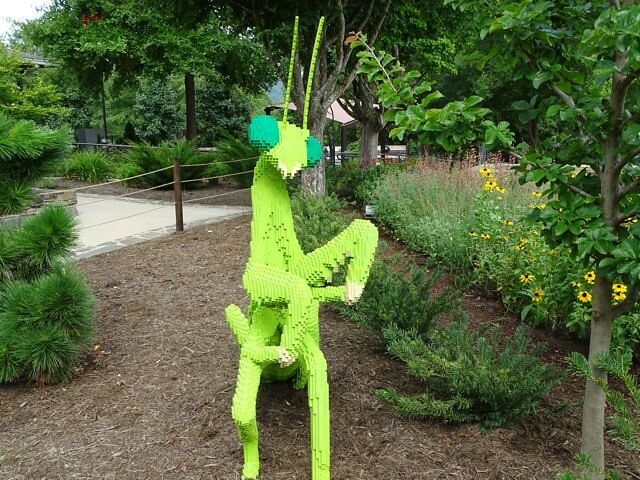 I really got a kick out of the 5′ praying mantis in the wildflower garden. Such talent to create such unusual art. Thank you for sharing your fantastic photos! Oh my goodness sakes, the Lego display is out of this world. How in the heck did he get the hummingbird. To be flying on the thin bill going into the flower? What an artist! I have a friend that has been wanting to go to the mountains and this is something right down my alley I would really love to see. Do you remember the exit number to get there? I’d like to go before the show closes, how long is it going to be there? Sorry I’m asking so many questions. Started to make your chicken with mushrooms in white wine but I have misplaced my copy of the recipe, have hunted high and low and I know I put it in a safe place but cannot remember just where I have put it, oh well, its here somewhere. Well I have some donations of some old McCalls books I want to donate to the Senior Citizens Center here in Fayetteville so they can make knitted and crocheted articles for others cause I know I want ever be able to make any of these things anymore, my hands just want work as good as they use to. Also have a bag full of clothes for the thrift store here that helps the battered women and children of Fayetteville Co. so I have a full day ahead of me so best get started. 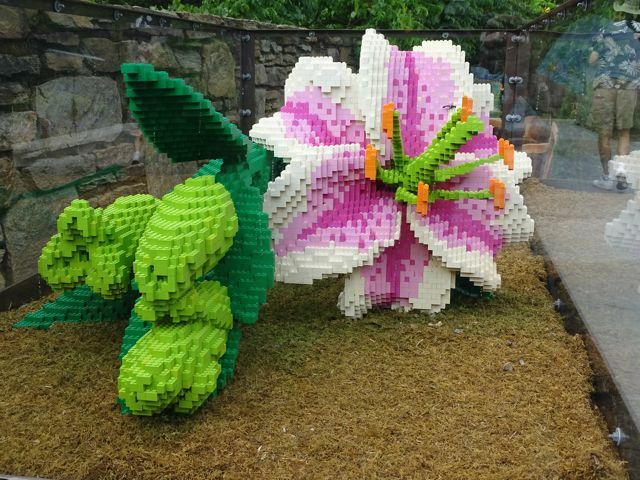 We live in Fredericksburg VA and drove to Richmond two weeks ago to see the Lego’s at the Lewis Ginter Botanical Gardens and they were truly fantastic. You really DO have to see them in person to appreciate them. I think they will be at this location until sometime in September. I didn’t see the praying mantis, squirrels or the giant lily, but we didn’t make it all away around the gardens because it was so oppressively hot that we couldn’t go any further but it was still worth the trip. The exhibit is incredible. Thank you so much for sharing. Fantastic exhibit! Ty and I were recently enlightened by a documentary we picked up at the library (PBS?). I found it absolutely amazing and had no idea how far the world of Lego has come these past couple decades. What a fun occupation; a Lego designer. Who woulda thought! Fantastic way to enjoy a day for sure!!! I especially liked the eagle. The realism created is amazing. This is so cool. What a fun adventure. Incredible. I have been to lego shows before but nothing like this. I wonder if they use “computer technology” to make the patterns and assist with assembly? I sent your webpage to my mom and dad to look at! What a wonderful post! I enjoyed every photograph. Many thanks for sharing them. How beautiful is that! OMG, this is one talented person. Wish I was headed down that way, I’d definitely stop there. Thank you so much for sharing this art. 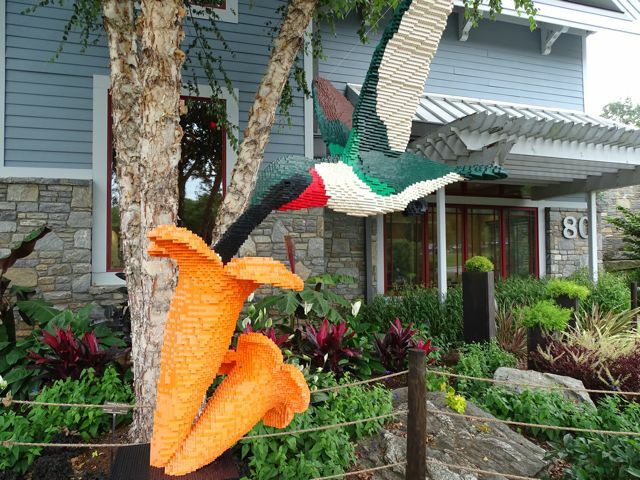 Isn’t amazing what they can make with legos. Thanks for sharing your pictures. Wow,this is fantastic, so many hours, with delicate hands, that eagle, then the butterfly, and the praying mantis, look at its tail. What a great exhibition, and for all ages, every child would be in total wonder, not to mention us adults too. I just had to share this post with my son. As a kid he absolutely loved Legos. I imagine that if he were to receive a Lego kit even now at 27 he would still think it was a wonderful gift. Your photos are beautiful. Those are amazing! Thanks for sharing. What fun. Wow! Thanks for taking us on tour with you. The size of the work is fantastic, adding to their jaw dropping qualities! Love the lego exhibit. The one that was in Huntsville, Al was different but so amazing. Love seeing your pictures. Amazing! Thanks for sharing it. WOW! 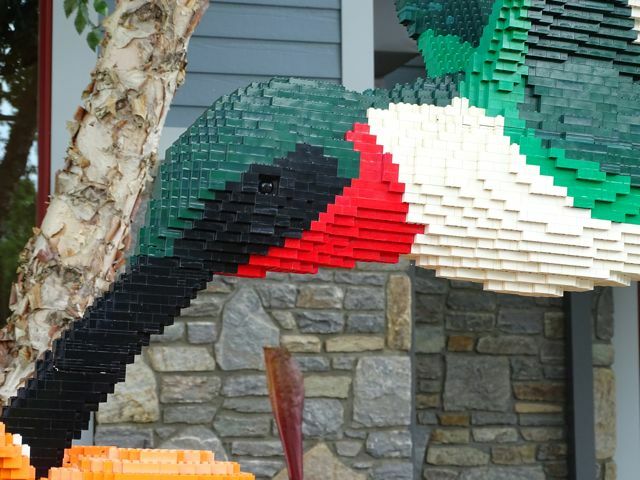 Those are some amazing Lego sculptures ♥♥♥♥ My youngest grandson would love to see all of them. Thanks so much for sharing!!!! 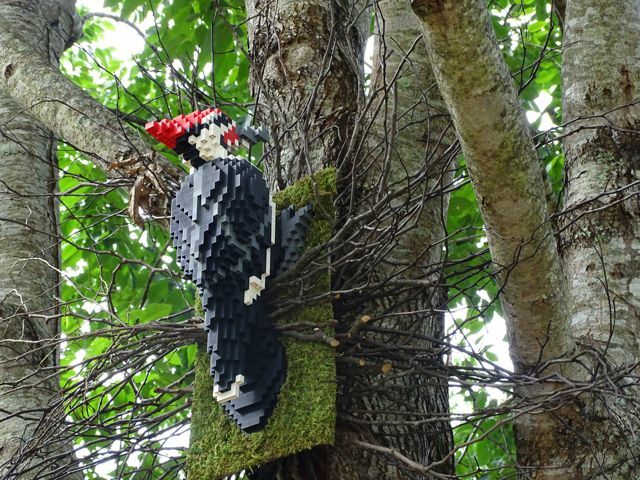 Amazing work with Lego bricks. Thanks for sharing. Very impressive exhibit. Everything looks so detailed! Lucky you to have this exhibit so near by! The photo’s are great! AWESOME!!! 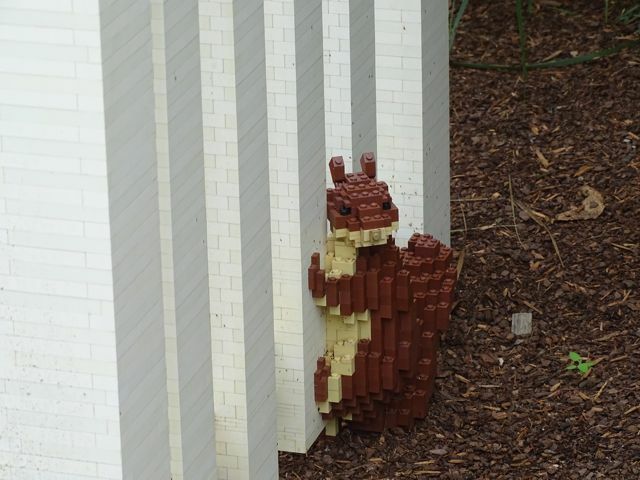 When our girls were young we took them to Legoland…this reminded me of that! This looks amazing! My son and daughter love legos, we are going to have to make a trip up. Wow. Thank you for sharing those! That is amazing. I love Legos, but I can’t even begin to imagine doing the smallest of these pieces. 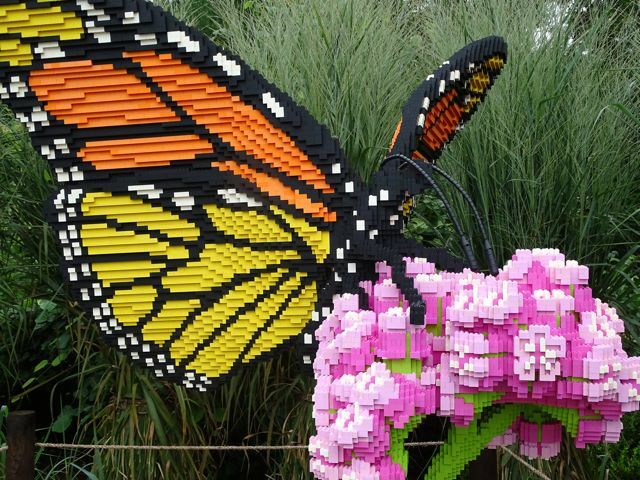 I think I accidentally deleted my first comment… These Legos are beyond amazing – wow! What detail and imagination. I have to show these photos to my boys! Wow – what an amazing exhibit!!! I will have to see if there will be one in the Northeast! !